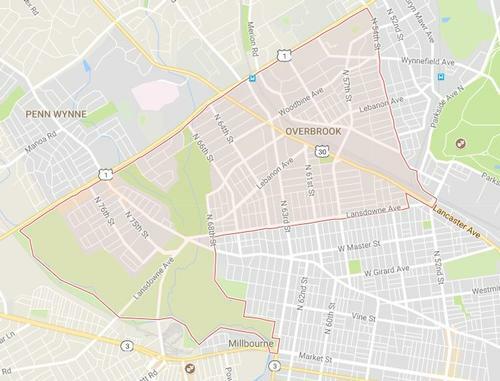 Overbrook gets its name from a train station built over a brook. This is quite appropriate, as it was the Pennsylvania Railroad that bought trolley rights to Lancaster Avenue from 52nd Street to Paoli in 1876 and began development in this part of Philadelphia. 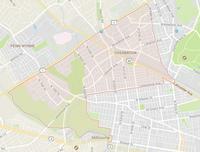 The Overbrook area of Philadelphia includes Overbrook, Overbrook Park, Overbrook Farms, and Morris Park. In the 19th century, country living was for farmers and the wealthy who could afford to build rural retreats in addition to their city mansions. 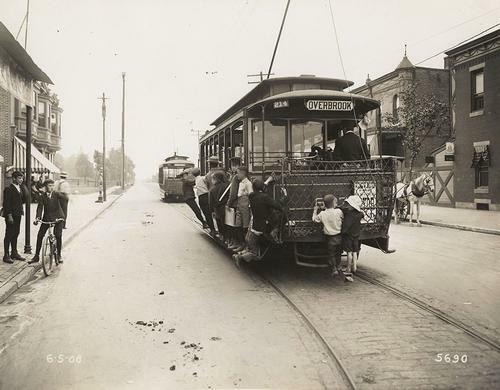 The development of horse-drawn trolleys made it possible for well-to-do middle class families to escape a city full of factories and crowded with immigrants who came to work in them. Developers followed the trolley lines and built spacious homes with amenities like gas and eventually electricity. Overbrook, at the western edge of the city, became a desirable place to live. By 1899, the Overbrook Station had 64 trains a day, running every half hour. Many of the new homes in Overbrook were rowhouses, but they were larger than those in the rest of the city. Developers also built "twins", semi-detached houses which were larger still. Then, in the 1890s, Drexel & Company joined the Pennsylvania Railroad in purchasing the John M. George Farm, a 165 acre tract near the Main Line. This became Overbrook Farms, a planned community of free-standing homes designed by famous architects like Horace Trumbauer, and costing up to $35,000 (equivalent to $1 million+ today). Overbrook Farms Club controlled the development and is the oldest continuously operating neighborhood association in the U.S.
Overbrook Farms had its own central steam heat plant, one of the first in the country, as well as its own electric light plant. Water was pumped from four wells into a reservoir. Overbrook High School was built in 1924 and is now on the National Register of Historic Places, but its graduates are more famous than its building. At least 11 Overbrook graduates have played in the NBA, including Wilt Chamberlain and Walt Hazzard. Other famous graduates include Will Smith, actor, rapper and producer, Jon Drummond, Olympic track gold-medalist, Willie L. Williams, former police commissioner of Philadelphia and Los Angeles, Bill Cash, Baseball Hall of Famer, and Catherine Pugh, Mayor of Baltimore. The African Episcopal Church of St. Thomas at Overbrook and Lancaster Avenues is home to the oldest Aftrican Episcopal congregation in America. It was established in 1792 by Richard Allen and Absalom Jones, who became the first Episcopal priest of African-American descent. Overbrook is also home to the Overbrook School for the Blind, originally the Pennsylvania Institution for the Instruction of the Blind, the first school for the blind in America. Julius Friedlander opened this school at 20th and Race Streets in 1833. It moved to its present location at 6333 Malvern Ave. in 1899. Although an interesting and informative article overall, the failure to include Dr. Guion S. Bluford in your list of famous graduates from Overbrook High School demonstrates a lack of basic research and is a glaring omission. As a public library, you had an opportunity to educate people about the accomplishments of a notable African American aerospace engineer who served as a NASA astronaut and was the first African American to fly to space. It's unfortunate that athletes and entertainers are frequently highlighted in society while notable educators, engineers, and scientists are overlooked...pun not intended. Thank you, Eagle, for pointing that out. Dr. Bluford deserves more than just a mention and I will do some research for a future post about him. In the meantime curious readers may find the basic facts in our Knowledge Base under Philadelphia FAQs>African Americans.